Ugh – that horrible feeling when a stomach ‘bug’ hits you can be overwhelming. Nausea, vomiting, diarrhea, headaches, and just plain miserable is something no one wants to go through and at the time it is happening, it can literally feel like you are going to die. At some point, it would almost be a welcome relief! Generally after a day or so, the symptoms subside and you go back to your normal routine. Just another flu, right? Most stomach ailments do not come from the flu but rather one of the several food-borne illnesses that occur throughout the world daily. Some cases are mild and merely cause discomfort for a day or so with running to the bathroom every fifteen minutes. Dehydration of course is always something to watch out for, but for the most part these cases clear up fairly quickly. There are others however such as botulism, that can be fatal at any age, and E.coli which is particularly harmful to senior citizens and very young children. 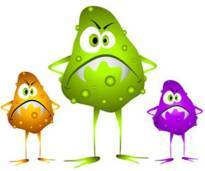 Many different things can cause bacteria to form in food that will be passed on to anyone who eats it. Food borne illnesses are preventable, however many times people don’t even realize that the practices they are doing to store and handle food are putting them at risk. Our kitchens are breeding grounds for bacteria to thrive if we are not conscientious of how we handle and prepare food as well as care of cooking utensils and keeping things clean. Hand washing is of course essential as well as keeping leftover food properly stored in the refrigerator rather than left to sit out. These few simple things would go a long way in preventing food illnesses and infections. Food-borne illness, which is more often referred to as ‘food poisoning’ is caused by bacterial or parasitic contamination of food or food storage. There are several different bacteria that cause people to become sick if ingested including E. Coli, botulism, and salmonella to name just a few. The two most reported types of food poisoning are Escherichia Coli and Staphylococcus and while most cases are certainly not fatal, it can be extremely dangerous if it doesn’t clear up within a day or so. These are only two among many that are found in cases of food-borne illnesses across the world, and it’s important to know what they are and what risk factors need to be taken into consideration. This particular bacteria is most often transmitted by humans especially food workers that are in contact with contaminated dairy products. The risk for the contamination to spread is increased, especially if strict food-handling protocol is not enforced. The toxins produced from Staphylococcus aureus are not affected by heat and are resistant to purifying agents (such as salt). In other words, if the food has this bacteria multiplying and you consume it – you are very likely going to get sick regardless if it is cooked or not. Sandwiches, especially those including sliced meats, are a prime target if not handled properly from the beginning. Symptoms include the usual gastrointestinal problems such as vomiting and diarrhea, but generally clears up within a couple of days. Time of ingestion until time the illness attacks can be anywhere from thirty minutes to six hours. This type of food poisoning is nowhere near as common as some, but makes up for it by being much more dangerous. This type of illness is caused by the bacteria Clostridium botulinum and can be caused by an open wound or in the case of food, improper preserving methods and contaminated canned products. The bacteria starts in water and soil that has not been treated and the spores multiply quickly. Improper canning procedures as well as smoked or raw meats will often bring about a case of botulism if consumed. Infants are especially vulnerable to the bacteria, and are particularly at risk if they eat honey or corn syrup, where the bacteria can be easily formed. Symptoms of Botulism range from nausea, respiratory difficulties, dry mouth, seeing double and in more serious cases, paralysis and even death. Infants will have weakness, constipation, poor feeding and difficulty crying. With this type of food poisoning, there is no question – get to the hospital as quickly as possible where you will be treated with an antitoxin and if in respiratory distress, admitted and monitored. Time is of the essence with botulism, so don’t waste time getting medical treatment if you suspect you have been infected. One of the most common types of bacterial borne food illnesses, salmonella is most often spread through the unsanitary preparation and storage of food. Salmonella is most often found in cases of undercooked poultry such as chicken or turkey but it is certainly not limited to those foods. Over 40,000 people are afflicted with salmonella poisoning each year and it occurs most often in younger people (under the age of twenty). Symptoms of salmonella include the usual aches, pains, nausea and gastrointestinal distress, and in the elderly and infants can be potentially dangerous, as any type of illness that leaves a person dehydrated. The shigella bacteria attacks the intestinal lining and causes sudden and intense abdominal cramping. Commonly known as one of the types of “traveler’s diarrhea”, it is often contracted when exposed to even a small amount of contaminated food or water. The symptoms can last anywhere from a couple of days to a week and dehydration is the biggest concern. And the rarer (but potentially deadly) shigella dysenteriae type 1. The last type is not commonly found in the US but has shown up in third world countries. This is also another type of traveler’s diarrhea, and the symptoms of this particular food borne illness do not show up for several days. However, once it hits, it is the usual bouts of diarrhea and cramping that occur with many of the other types of food poisoning. What can be concerning is blood in the stool which should be addressed with a medical professional. Otherwise it generally clears up on its own, although it is extremely uncomfortable. Be sure and hydrate with electrolyte based fluids regularly. The tapeworm that affects thousands of people every year is found most frequently in undercooked fish or seafood. Sashimi, which is fish that is eaten raw, must have extremely strict handling and preparation guidelines that are followed or otherwise, a trip to the sushi restaurant will likely lead to a bout of severe food poisoning. This particular type is slow acting, with larvae growing in the intestinal tract for up to six weeks. Megaloblastic anemia and deficiencies of vitamin B12 are very often end results of this illness. The scariest thing about this type is that there are rarely symptoms. One might feel occasionally weak or crampy, but may write it off as something else until more serious conditions occur. Medicines such as Praziquantal are used for treatment, usually given in one dose. This is the most common type of bacteria to cause traveler’s diarrhea. It is often in the intestinal tracts without causing any major issues, however there are some strains that cause food-borne illness to happen. One of the most dangerous is E. coli O157:H7 which can be fatal, especially with infants and the elderly. It is often spread through human contamination (especially if hands are not washed during food preparation). This is also the type that has shown up in raw fruits and vegetables from mishandling. It causes fever, cramping and diarrhea that can include blood in the stool. Rehydration and small meals are recommended until the bacteria has passed. This is by far one of the most deadly of the food borne illnesses. It is the third leading cause of infant meningitis and nearly 30% of the cases result in death. It is rarer than some of the others, but is certainly a concern with over 2,000 reported cases each year and 500 that end in death (numbers approximate). Pregnant women are cautioned against eating soft cheeses which may contain the bacteria which causes this illness. Symptoms range from high fever, a bit of nausea and possibly vomiting, but generally clears up in a week only to come back with a vengeance. Once it enters the brain, the symptoms of meningitis start to appear including stiff neck, altered mental state, problems keeping balance and seizures. It can be contracted through the bacteria contaminating food, water, and food utensils.